For a budget addition to your tool kit, consider the Nebo Redline Tactical Flashlight: it’s not one of the performers, but you’ll find it hard to get any better in this price range. Highlights of the Nebo include its magnetized base, the 220 lumens beam for brighter illumination, and 5 different lighting modes. The Nebo Redline Tactical Flashlight is good, budget LED flashlight with a couple of really useful features but also a few kinks as reported by existing users. If you’re looking for a torch with a really bright beam, the Nebo is probably the best in its category and price range. It is capable of momentarily blinding whoever’s face you point the flashlight to which is why it has been coined an “aggressive tactical flashlight.” It has three brightness options: 100% (high at 220 lumens) with a range of 150 yards, 50% (medium at 110 lumens) with a range of 65 yards, and 10% (low at 22 lumens) with a range of 30 yards. The flashlight also has an S.O.S. mode at 220 lumens which is a Defensive Strobe mode and an Emergency Flashing Strobe mode also at 220 lumens. To activate the S.O.S., you press the rear button 4 times while to engage the Flashing Strobe mode, click on the same button 5 times. Now this rear button is also the main control for all functions of the flashlight and it has a glow-in-the-dark feature that enables you to see it quickly and easily. Using the button is a choice of click or soft touch and although it can get confusing at the start, you shouldn’t have a problem over time and with some practice. You can adjust the beam to get short range lighting or spot lighting. It’s a simple twist of the bezel counter: clockwise for the flood lighting and counter clockwise for the spotlight. Moreover, it has a magnetic base that makes it possible for hands-free operation which would be a step above the usual one-handed operation and can handle water exposure so you can take it with you and use it under almost any outdoor condition. On the downside, the design of the power button is a little hard to get to because it is sunk into the casing. Anyone with big hands may have a difficult time using it and trying to use your thumb usually is awkward. This annoying feature is countered with the Nebo’s magnetized base which is really useful. There is also a slight delay when switching modes. 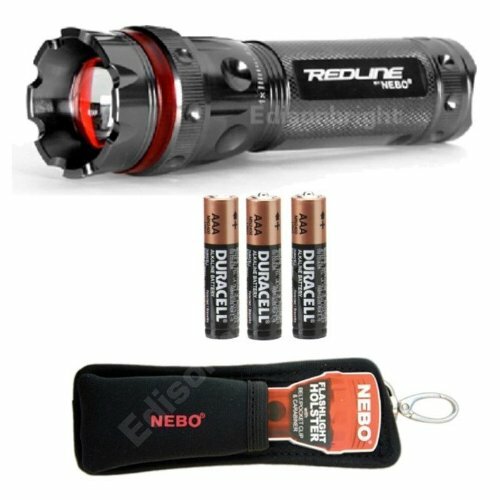 If you are looking for a tactical flashlight, there are others that are cheaper and “more tactical” than the Redline Nebo. If you want something that is good for many purposes and favor bright lighting, then the Nebo is your best bet. The Redline Nebo 5581 Tactical Flashlight is a good find. It has earned 4.3/5 stars from Amazon verified customers. As an LED flashlight, it is considered one of the brightest with the high output of 200 lumens in the market under its category and price range. As an emergency source of light, the magnetized base means you can set it up and let it stand to send off signals while you do other things. A great buy considering other flashlights of this caliber are much pricier.